So, it is really nice to see some people being enthusiast for this contest . As said earlier, we're gonna start this Sunday. We had the results of the roundup already, so now you could prepare yourself to be challenged by the Golden Height Contest. As promised, we give you the rules today and we'll reveal the building area. - You must build your coaster within the green/yellow area. - You must build the station inside the yellow area. Storage don't have to be inside the yellow area, you can also make it in the green area. - Of course, you can't change the mountain setting. - You can make yourself a custom station or theme your coaster, but you won't get any points for this. - You cannot design your coaster less then five meters above the road. So it has to be above these 5 meters. To help you, we put a clearance above the road, your train may not touch it with the clearance enveloppe. Supports aren't allowed there either. - The managers asked us to let you design a coaster with a minimum length of 800 meters/2625 feet. - You cannot build this tunnel underneath the entrance road. - Talking about the entrance road: your coaster must be on both sides of the road, so your coaster has to pass the way at least twice. 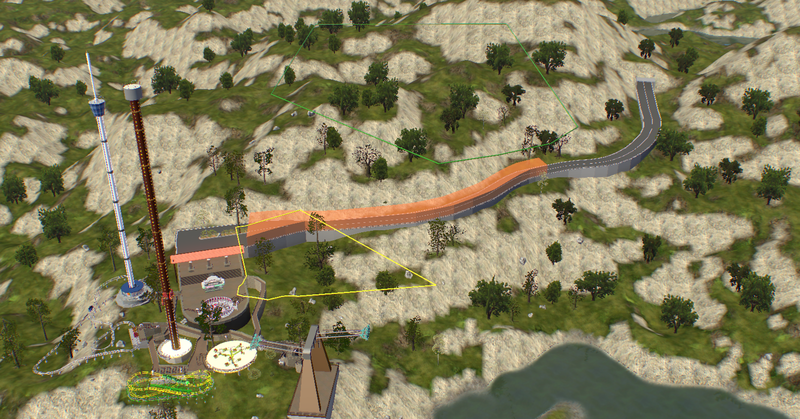 - We decided to put no maximum length, so Togo, you can design your longest mountain side jet coaster. There is also no maximum height, but keep it realistic. We know it is a very hard terrain to make a coaster on it, but somewhere, we have to challenge you. - Make sure the footers don't clip with the terrain. - There are some flat areas provided in the area, so there you can place most of your footers. - You can design a wooden terrain coaster or a giga coaster or a dive coaster or ... Choose what you like the most. Multiple entries are allowed! 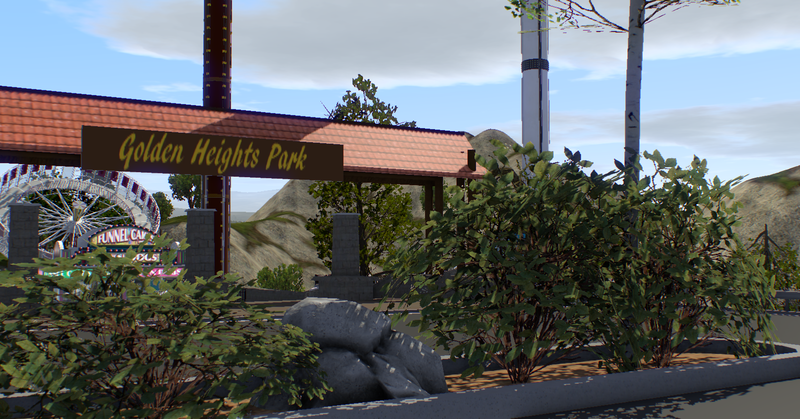 - Make sure your coaster looks great, has some nice interactions with the road and the terrain. - O, and one minor thing: make sure your brakes are the correct ones: magnetic breaks can not hold your train in real life, so that is no Block Brake. - Make your coaster as realistic as possible, you don't have to make an accurate B&M or something like that, you can also be an invented coaster building company, just make sure it looks realistic. Sunday, a download link for the template will be placed. PS. Do not hesitate to ask a question about the contest. We're both in the NLC-discord or you can place your question here in the topic or send it with the Messages option or ... We're here to help you making the most beautiful coaster in a mountain setting. Surprise! https://drive.google.com/file/d/1-atfA0 ... sp=sharing Good luck everyone! Before it's an issue. If I build a footer and it's inside the boundaries and then when the game renders it in the sim it ends up touching the boundaries or partially outside of them, what's the ruling there? Touching is ok but it is not allowed to have it outside of it. It sounds fun, but when is the deadline? The template is probably the most detailed contest template I've seen. Why don't you connect the winning coaster's station to the path network, in the style of the other rides? You could even release it on the Exchange then. My jet coaster has custom brakes now. I am adding this huge truss. Japan likes to use huge trusses like this. Anyone else making a jet coaster like I am? If an airplane themed ride counts, then yes. Don't want to spoil too much, but I'm in. Would mark the tallest cobra roll, by a decent margin. Is this ok? It is a covered stairway. It’s ok because it is scenery. I sent in my entry by email. I've never done a contest before. Am I supposed to add foliage and scenery around the coaster? I started playing around with the template last night, and if I can get something decent done by the deadline I'm in. Not sure if I'll have time since December is going to be really busy for me, but hopefully I'll come up with something. Yes, but you won’t get extra points for it. Are we allowed to do minor terrain modifications to fit our track? No, you are NOT allowed To modify the terrain. You Can delete all the trees and rocks if you want. We are done! 18 entries, thanks everyone for participating. Now it is our time to shine! Aaaannndddd I forgot about this whoops! Only had one section of supports to do as well. Just got caught up with other projects, and a bit of life. The entries that I've seen so far look pretty neat. Good job and good luck all. Add one more to the "I forget" camp. Got about 3/4 of the way done with it, then got busy with holiday stuff and completely missed the deadline. Would have been nice to have a one week reminder, but oh well.